The Cape Cod Baseball League welcomed eight of its greats back to the Cape with the induction of the Hall of Fame Class of 2012 at Chatham Bars Inn on Saturday. The day was marked by stories of host families and old college pranks, visions for the future, fond memories of the past, and even a haunted house. 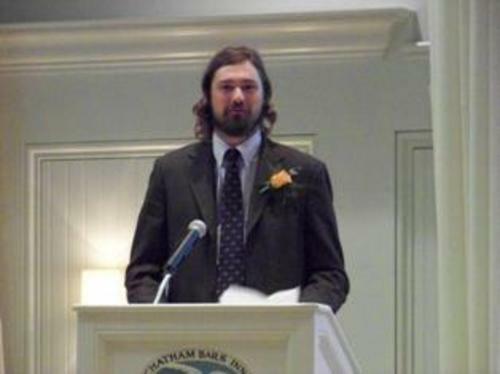 Headlining the class were Red Sox southpaw Andrew Miller (Chatham 04, 05), and Admiral John (Jack) Aylmer (Barnstable Barons 52), who was instrumental in establishing the modern day Hyannis and Bourne organizations. The class stretched a century of players, from the late Danny “Deacon” McFayden, who led Osterville to its second straight title in 1924, to Miller, an All-Star who won the league’s pro-prospect and co-pitcher of the year awards in 2005. It was inductees like Jack Aylmer and Laurin “Pete” Peterson who paved the way for future stars like Miller to shine. Peterson was one of the first Cape managers to begin recruiting notable college players, including Cal Burlingame, Roy Bruninghaus, Buzzy Wilcox and Art Quirk, who all became CCBL Hall of Famers themselves. For the inductees, the honor of being included was overwhelming. Making his way to the podium last of the eight, Miller appreciated the history that came before him. Among those stories was the tale of the haunted host house, courtesy of inductee Jim Sherman, the current head coach at the University of Delaware. During the first of his two summers on the Cape, Sherman found himself in a home where doors opened and closed inexplicably during the night. The story wound up in Sports Illustrated not long after, and had the packed room laughing right along with him. “The Cape League is a terrific place, but more importantly, what you see is it brings people together, which is what sports really do,” said inductee Dan DeMichele. The class brings the total number of Hall of Fame inductees to 124. Several other members of past classes attended the ceremony to welcome the newest members, and included League President Judy Walden Scarafile (03), League Vice President Peter Ford (10), Bob Butkus (04), Ken Voges (05), Jim Hubbard (06), Ed Baird (03), Steve Saradnik (07), Noel Kinski (03), Arnold Mycock (00), and Art Quirk (09).